To give you a brief synopsis, the book is about a secret society that decides it would be a good idea to summon up a dragon in order to overthrow the Patrician of Ankh-Morpork, gain control of the city, and use the “king” that kills the dragon as their puppet leader. Needless to say, things get a little out of hand and the secret society ends up biting off way more than it can chew. In the mix with this, you have the washed up, drunken captain of the city Watch who has tender shreds of decency and conviction about his post who seeks to unravel the mystery behind the extinct dragon that’s flying around, terrorizing the city. You, of course, have old favorite characters around like Carrot, Nobby, Colon, Sybil, the Librarian, and Death. This is definitely a fun place to start reading Discworld novels if you’re unsure where to start. It is a great introduction to certain characters and of how the city of Ankh-Morkpork operates. I tend to read the books (very) out of order, so I have read many other Watch books before this one, but it was a delight nonetheless. Go out there and grab a copy and get to readin’! Click for the image source. Steam Trains, and Ghosts’ review of Guards! Guards! 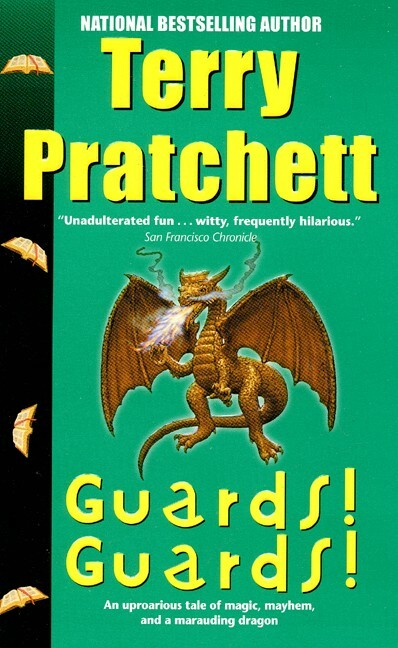 Sci-Fi Reviews.net’s review of Guards! Guards! ← Enter the Night Bells Giveaway on Goodreads!